It is time for the Annual Fall San Francisco Antique Show my friends! It is going to be a beautiful day in the city, so I hope to see you there! FLOWER POWER is the theme of this year's show, and the blooms are everywhere. 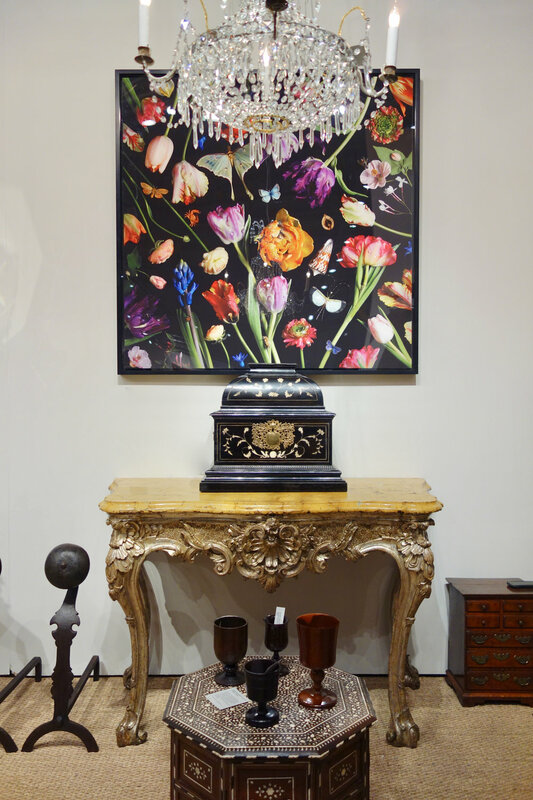 From floral displays in giant urns, to paintings of Spring blossoms, vintage jewelry made with gems cut into flowers or all kinds, flowers and fronds carved into antique chair legs, woven into tapestries, bunches hanging from the ceilings and draped across French fainting couches. 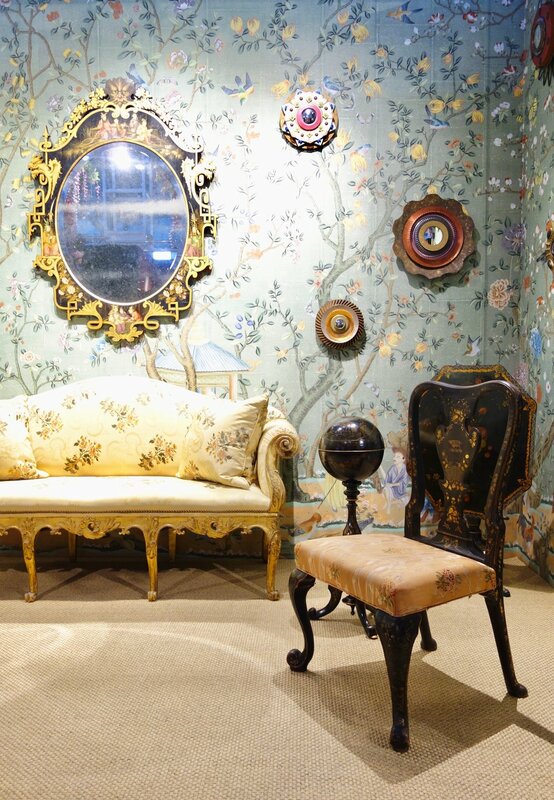 They are embroidered onto de Gournay wallpaper, painted onto wall murals, and needlepointed onto boudoir stools. It is a beautiful display of color and romance! The organizers of the Antique Show want us all to know that "As always, 100% of net proceeds benefit Enterprise for Youth (http://www.ehss.org/), the San Francisco nonprofit that has, since 1969, prepared and empowered a diverse group of Bay Area youth to pursue life after school with passion and purpose. Enterprise offers students everything they need to get and keep their first job, including intensive workshops, pragmatic skills and career exploration training, a network of advisors and peers, a broad database of paid internships, and college and career counseling." Yes, the flowers are bountiful at this 36th Antique Show chaired by Suzanne Tucker. 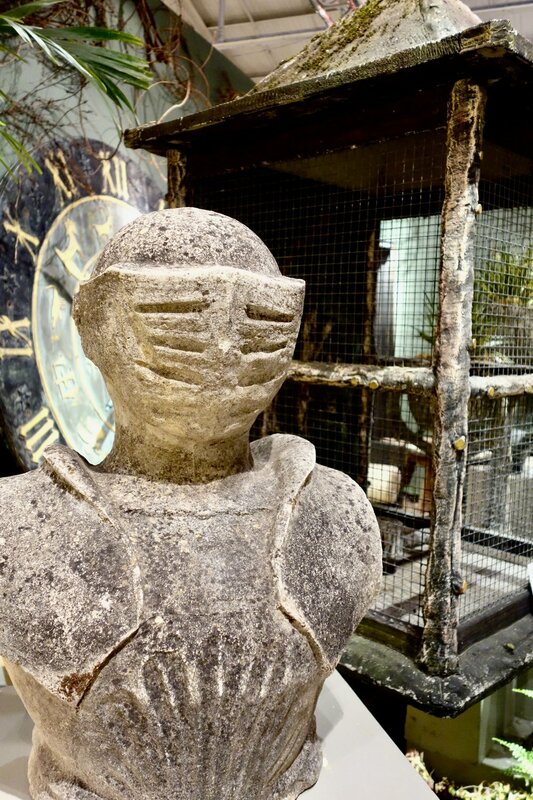 Fifty dealers are featured from all over the world and they have created romantic vignettes with carefully selected antiques of all kinds (that are for sale BTW!) always keeping in mind FLOWER POWER! So I hope you enjoy some of my favorite snippets of the show! It is an instagrammer's paradise! SO...Fort Mason Center for the Arts & Culture's Festival Pavilion is the place to be THIS WEEKEND....Oct. 26th through 29th. There will be book signings, a Lecture Series and Cocktail Hour talks. Time to check it out if you have never visited, and time to reconnect with your favorite dealers if you have! Tickets are available online at www.sffas.org. Hope to see you there!